If you want to take up a book keeping class and become an expert in this field, then it is highly recommended for you to enroll in the book keeping certification program which is now included among the many offers of Brainmeasures. 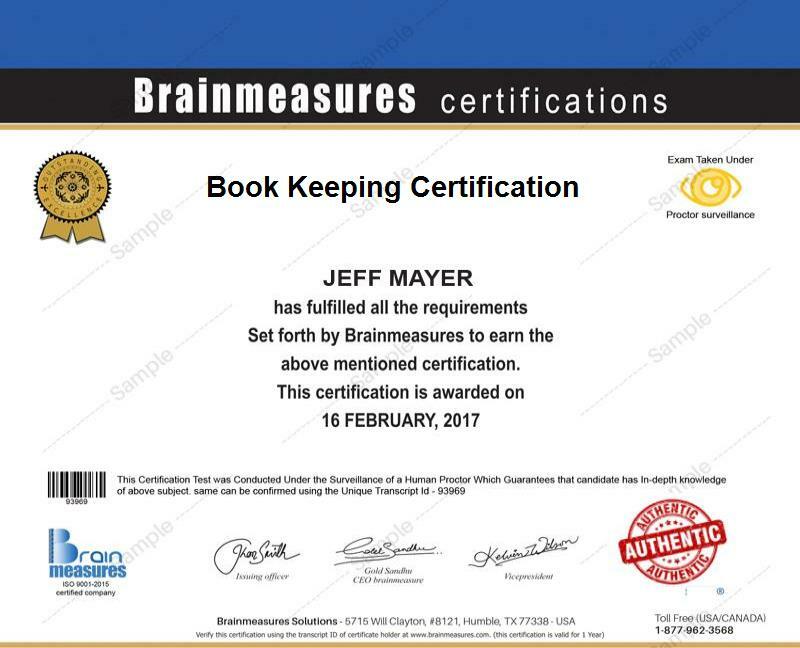 The excellent reputation of Brainmeasures as well as the ISO certification that it has already received can give you an assurance that you will be able to receive accurate information and the best training from the book keeping course that it offers. The comprehensiveness of the book keeping training which you can get from the certification course is also a huge help in your attempt to understand all the principles that you need to follow in recording financial transactions in the most efficient and accurate manner possible. This will allow you to produce accurate records that will be extremely useful to the entire accounting and financial department especially in creating sensible accounting reports. Since the book keeping certification program offered by Brainmeasures is developed in a comprehensive way, you will never find it difficult to handle the online bookkeeping exam. This will allow you to receive your bookkeeping certificate right away and start working as a certified bookkeeper. How the bookkeeping equation affects business transactions? The book keeping certification program offered by Brainmeasures is a major help especially for those who are planning to enter the accounting and financial department of an organization. This is primarily designed for aspiring and existing bookkeepers who wish to improve their bookkeeping skills, professionals who are responsible in recording financial and business transactions of an organization and managers or business owners who want to be able to keep and maintain their own books of accounts. It will not also be hard for you to find jobs that can fit your desired level of salary if you have already completed your book keeping certification course. Book keeping certification holders can actually be expected to earn within the range of $25,000 to $42,000 if they are still starting out. As you gain more experience in the field, you salary range will also increase to $44,000 to $78,000. You can expect to earn more based on overtime pay, bonuses and other remuneration benefits provided by your employer.